On the shelves now at your local comic shop (and of course available on-line as well) look for issue #5 of Guardians Team-Up. As in Guardians of the Galaxy, you bet. 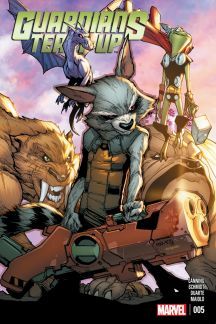 When Cosmo the psychic space-dog absconds with a six-pack of Rocket Raccoon’s favorite brew, the shortest and loudest Guardian takes off in hot pursuit — and ends up running into the re-united Pet Avengers. Just in time too, as the Pet Avengers find themselves locked in a battle with the newly-formed Pets of Evil Masters and their self-styled leader, Vulture Von Doom! Super-powered animals abound! This issue was written by Andy Lanning and Andy Schmidt, illustrated by Gustavo Duarte and Marcelo Maiolo, with a painted cover by Humberto Ramos and Edgar Delgado.